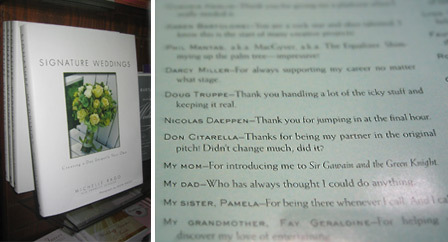 This weekend I was surprised and honored to be credited in the new book, Signature Weddings, published by one of my clients, Michelle Rago. I originally designed the conceptual book for her two years ago, through my company, ERA404. The book was published this Winter and is on shelves at Barnes and Noble. This is where I first learned of the credit, which states: “Thanks for being my partner in the original pitch! Didn’t change much, did it?“. Michelle’s sincerity in the quote and care for the credit are both overwhelming. As a side-note, the book is beautiful. She has compiled an amazing resource for brides-to-be, filled with experiences, examples and notes on the process she has created to design and produce some of the most memorable weddings ever. I’m honored to have been a part of it. I just read the book cover to cover and studied the pictures. It is a gorgeous book and the weddings were too. I absolutely agree, Anna. Michelle’s book is wonderful!